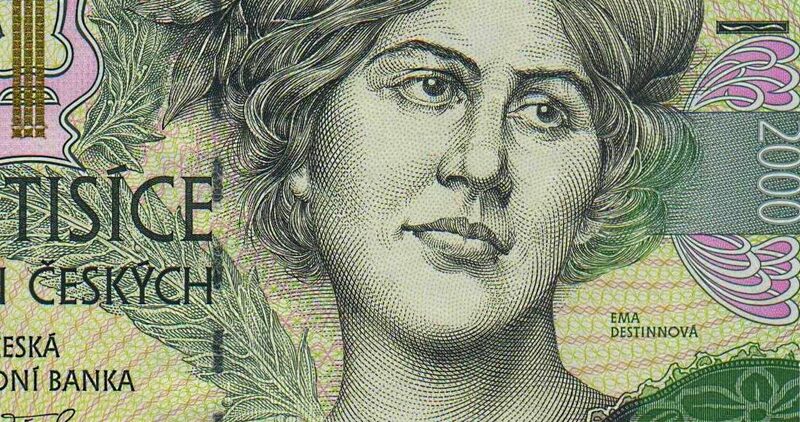 People in the Czech Republic know Ema Destinnová from her somewhat idealized portrait on the Kč 2,000 banknote. Her career as an opera star and even as a patriot is oft discussed. Less remembered is her love of the occult, spiritualism and fortune telling. She even had custom-made tarot cards. She lived from 1878 to 1930, singing professionally from 1897 to 1926. Her work quickly took her to the famous stages of the world. She had earned the nickname Divine Emma (Božská Ema) by 1904, and was often paired onstage with Enrico Caruso, who also had a romantic interest in her. Here is a recording of her singing with Caruso. 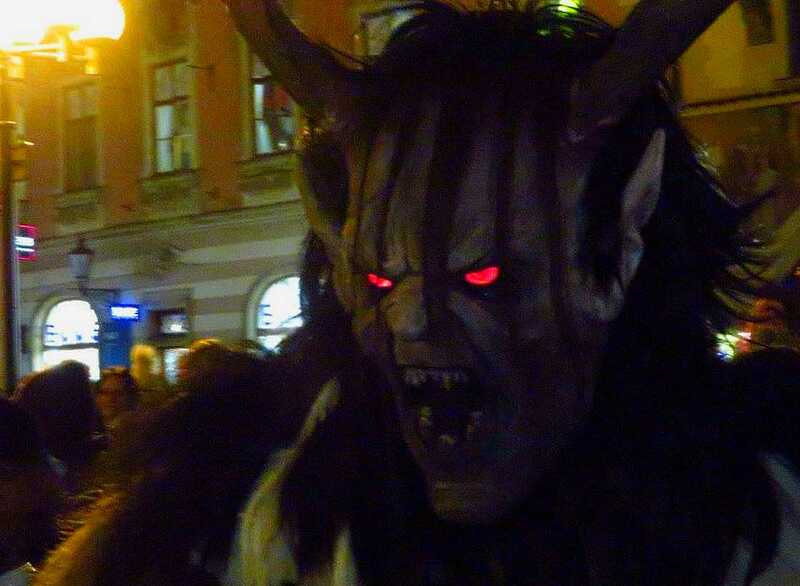 She also had another nickname later in life – the Black Lady of Stráž (Strážská Černá Paní). By some accounts, she was a proto-goth diva, bedizened in black and living with a skeleton in a black-decorated chateau while reading books on the occult from her massive library. She was already interested in spiritualism by 1901, when she was invited to the Bayreuth Festival, a German music festival at which performances of Richard Wagner’s operas are presented. This interest caused her to lose 15 kilograms of weight before her performances there, one friend noted, but the connection between her weight loss and the occult is not fully clear from her friend’s rather cryptic diary entry. She had also already started to gain her reputation for her love of black, or melanophilia. 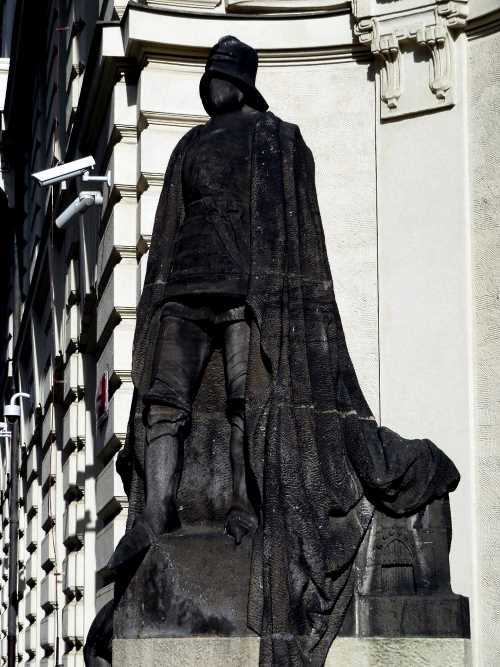 Among her artistic acquaintances in Prague she counted the sculptor Ladislav Šaloun, famous for his sculpture of Jan Hus in Old Town Square. 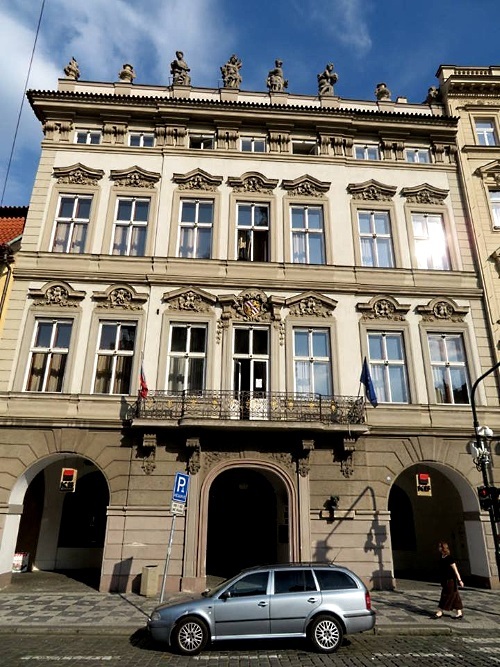 Šaloun’s Villa in Prague’s Vršovice district was built in 1908–11, when his earlier workshop at Wenceslas Square became too small. 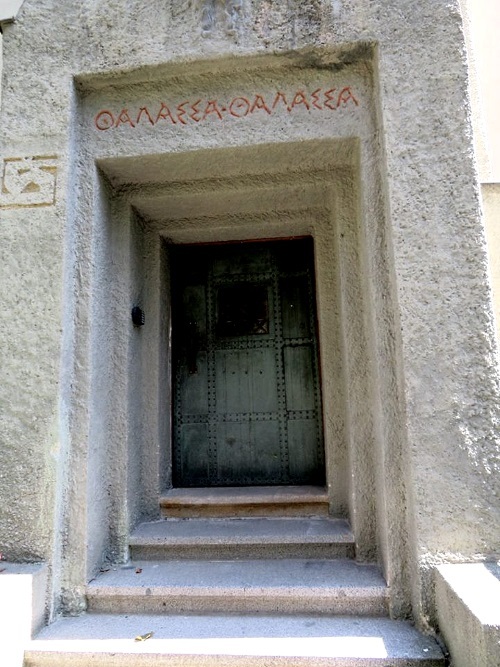 Writer Josef Vachal recounts that Šaloun’s basement was regularly used for séances. Aside from Destinnová and Vachal, the circle of visitors included the writers Karel and Josef Čapek, sculptor Frantisek Bilek, poet Otokar Brezina, painter Alfons Mucha, and the composer and conductor Jan Kubelík and his son Rafael, also a musician. It is not clear if all of these people from the artistic set attended séances, though. The Čapek brothers lived in a villa nearby, and might simply have been making neighborly calls. Her interest in divination is proven further by her possession of several sets of cards. She had a deck of tarot cards that she illustrated herself, with naive, almost childlike designs. Another tarot set was illustrated by artist Robert Schlosser, a student of the more famous Prague artists Josef Písecký (aka Liška), Jakub Schikaneder and Jan Preisler. This deck was commissioned for her by her husband. 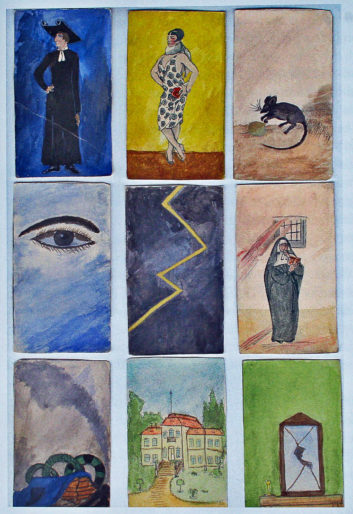 Fortune-telling cards painted by Ema Destinnová. 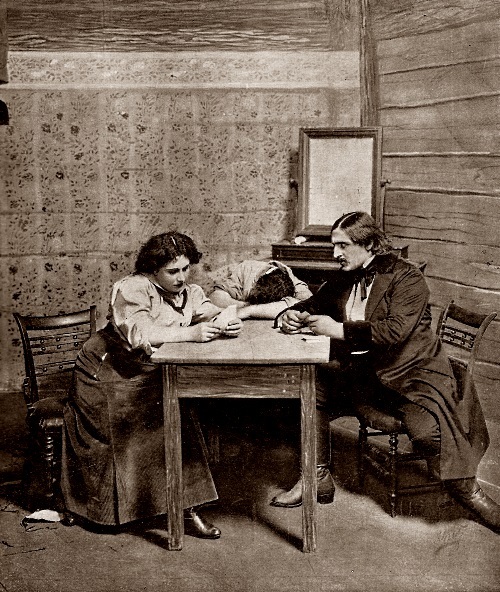 A more traditional tarot deck in her possession was by card maker Emanuel Klogner, who worked along the lines of the Tarot of Marseilles. 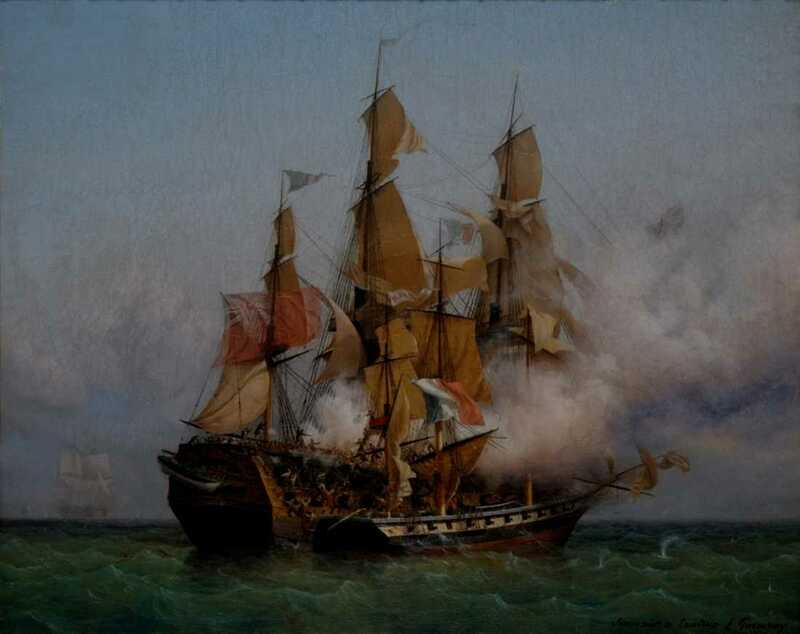 Her collection also included a deck with motifs related to the Napoleonic wars. Two more sets had handwritten texts in French. One was for fortune telling, and the other with questions for a parlor game that sounds a bit like an early form of Truth or Dare. Destinnová acquired a chateau in South Bohemia near Třeboň at a village called Stráž nad Nežárkou from the estate of Austrian Baron Adolf Leonhardi, who died in 1908. Her boyfriend, French-Algerian baritone Dihn Gilly, bought the property for her sometime between 1914 and 1916, and she acquired the title in her own name in 1920. At this point in her life, she did not make a single move without consulting the spirit realm in one way or another. Her main interest in that particular property was because the baron had filled it with a library of some 7,000 volumes, and some say twice that many, dedicated largely to occult topics. The chateau at Stráž was restored and opened to the public for the first time in 2006. A black “ghost room” above the dungeon in the tower at the chateau now has a crystal ball for divination and a human skeleton she named Ivánek, along with some bats and painting of Ema as the Black Lady of Stráž. The chateau is also notable for a secret door and passage to the singer’s bedroom, and another secret passage that leads out of the chateau. An account from the 1920s says the original skeleton in the ghost room was hooked up to an electric motor and could raise its arms and bow from the waist when someone entered. There were also three stuffed owls, a spider hanging from the ceiling and a coiled snake, presumably all stage props. An open coffin displayed a wormy corpse, the work of a Chinese woodcarver. A monk of some kind was reading in the corner, and it is not clear from the account if it was a real person or another motorized prop. 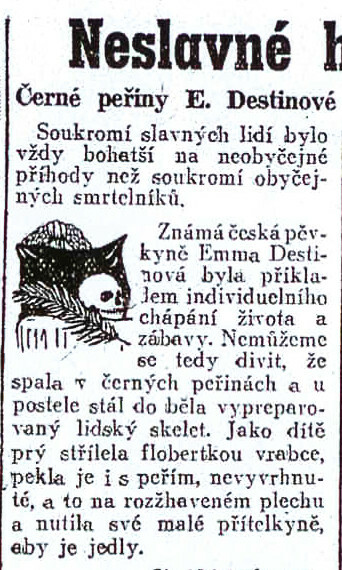 Destinnová reportedly took the skeleton, named Ivánek, on tour with her as well, with a sign saying “Vanity on top of Vanity, all is vanity”. A 1944 tabloid newspaper account in The People’s Pages (Lidové listy) said it was well-known she had a skeleton near her black-covered bed, but added to this a previously undisclosed and rather gruesome account of her as a child bullying a friend. This latter part has been disputed as wartime propaganda to discredit the patriotic singer. Destinnová’s brother, Emanuel Kittel, sought legal help at the time of publication to get a retraction. He was unsuccessful. Another account of her bedroom says that black embroidery was used to trim black silk sheets that had a white dragon motif, and the bedroom had a monastic look. An image of Christ on the cross and a full-size Madonna and Child were also part of the décor, this account states, failing to mention any skeleton. 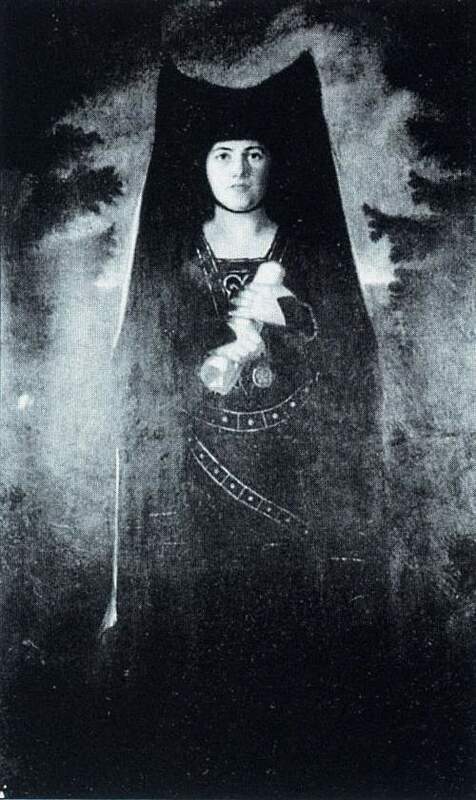 The occult library at Stráž was unfortunately broken up after she died in 1930 and auctioned off in pieces. A partial list of the library catalogs some 3,000 volumes. The topics of the books include alchemy, astrology, witchcraft, witch trials, herbs, legends, myths and fairytales, “revolutionary writings” on occultism, spiritualism, and adventurous and spooky writings, along with cookbooks, travel books and other more mundane topics, according to a summary by the Ministry of Culture. The ministry notes that there is underlining and reader notes, plus four types of book plates with “decadent motifs.” After World War II, some 201 works in 259 volumes wound up in the library of the National Museum. They likely became state property in 1949 after being seized. Destinnová’s career had a downturn when her passport was revoked in 1916 due to her support for the resistance to the Austro-Hungarian Empire. She mostly stayed at her estate at Stráž for the next two years, unable to travel and also unable to sing domestically. Destinnová resumed her singing career near the end of World War I, but did not find her previous level of success. As a result, she made the chateau her main base until the end of her life in 1930. Ema Destinnová, also known in the English-speaking world as Emmy Destinn, was the professional name of Emílie Pavlína Věnceslava Kittlová. She took the name Destinnová as a tribute to her voice teacher from her teen years, Marie Maria von Dreger Loewe-Destinn, who taught her from 1892 to 1897. Her last name is also sometimes seen with only one “n”, and is spelled that way on her tomb. She first studied violin before turning to voice, and initially found singing somewhat boring. Destinnová was born in Prague at a house that is now a restaurant at Kateřinská 7 in New Town. She was born on midnight Feb. 26–27, 1878, to an artistic family. She lived in Prague from 1908 to 1914 at Kaiserštejnský palác (Kaiserstein Palace) on Malostranské náměstí in Prague’s Malá Strana district, though she spent much of this time abroad due to singing engagements. 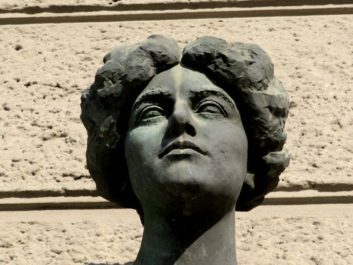 A bust with her likeness is displayed in front of the palace. Her later years, until her death in 1930, were spent mainly at her chateau in Stráž nad Nežárkou. Her father, Emanuel Kittl, owned 23 houses plus a distillery, breweries, and silver and antimony mines. He was a patron of the arts, and Ema inherited her adventurous and eccentric character from him. She got her musical talent from her mother, Jindřiška Kittlová, who sang for a while at the Opera Comique in Paris and also surrounded herself by well-known people. 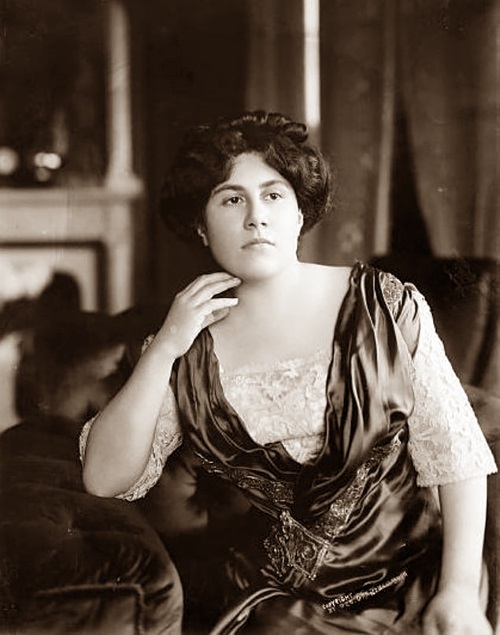 She made her operatic debut at the age of 20 on July 19, 1898, in Berlin, at what is now the Staatsoper Unter den Linden but was then called Königliches Opernhaus, in the role of Santuzza in Pietro Mascagni’s Cavalleria Rusticana. Her fame grew steadily and in 1901–02, she was invited by Richard Wagner’s widow, Cosima Wagner, to the Bayreuth Festival where she performed Senta in Wagner’s The Flying Dutchman. She debuted in London in 1904, where she sang for 12 seasons at Covent Opera, performing 47 times with Enrico Caruso. She made 225 appearances in 18 operas at Covent Garden. Ema Destinnová with Enrico Caruso in Puccini’s La fanciulla del West. In Berlin, she was asked by Richard Strauss to sing the lead in Salome, and first performed it on Dec. 5, 1906, with the composer conducting the orchestra. She repeated the role in Paris the following year. She debuted at the Metropolitan Opera on Nov. 16, 1908, in Aida with Enrico Caruso as her partner and Arturo Toscannini as the conductor. She performed eight full seasons at the Met, making 249 stage appearances in 21 roles. Her return from New York during the 1915–16 season led to the end of her career as a world-famous diva, and she had only limited success after that. Her links with the patriotic resistance movement in Bohemia resulted in her being kept under close watch and unable to travel abroad. 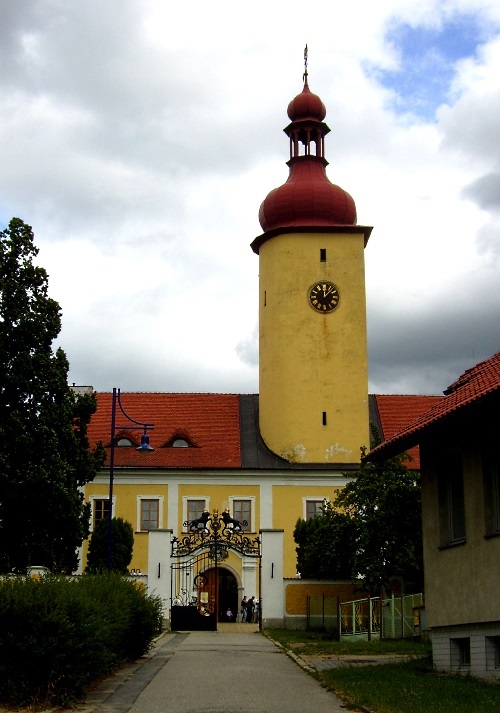 There is some debate over whether or not she was fully under house arrest, but effectively she stayed in her chateau at Stráž nad Nežárkou for two years. Aside from consulting the oracles, she spent her time fishing, and a monument at the chateau in Stráž marks her favorite spot. She also turned her talents to fiction writing. Meanwhile, new singers took over the roles she had become famous for, and her voice began to deteriorate. 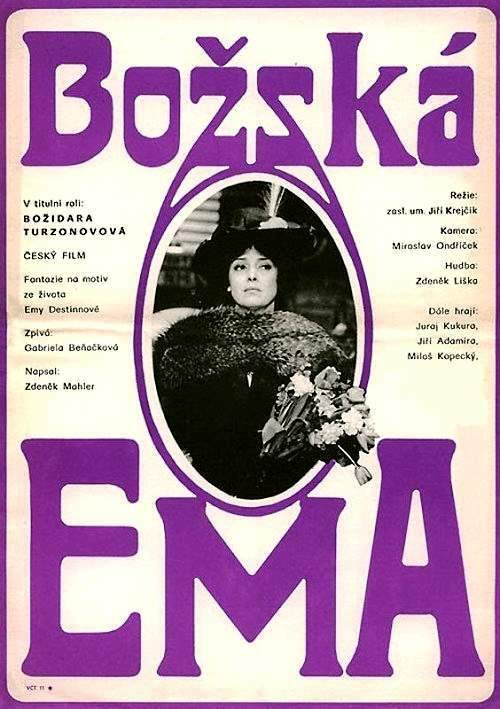 A highly fictionalized account of her involvement with the resistance is told in the 1979 Czech film The Divine Emma (Božská Ema). It was submitted for consideration for an Oscar for Best Foreign Film, but was not nominated. The film has her involved in espionage, and transporting a message in invisible ink. 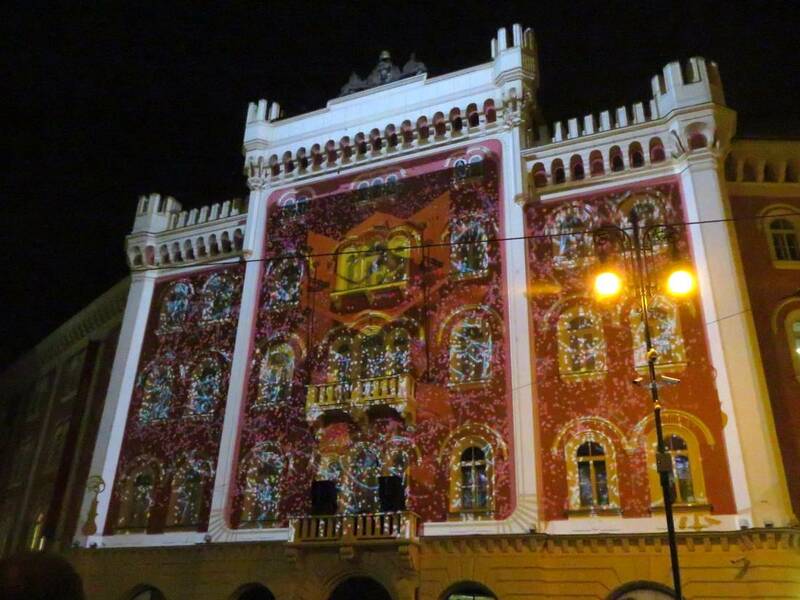 Toward the end of the war in 1918, Destinnová was allowed to sing again at Prague’s National Theatre. She also performed in other Czech cities, and was met by enthusiastic crowds. She usually ended recitals with patriotic songs. 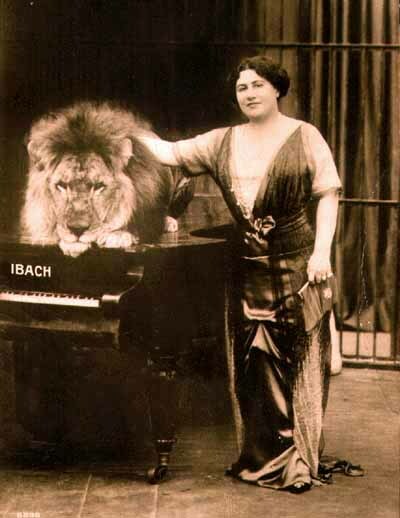 She toured Europe and even visited New York again between 1919 to 1923, and tried to promote Czech opera, but mostly making guest appearances and giving one-off recitals. Her income was not at the same level as before the war, but she tried to keep up appearances despite her financial situation. 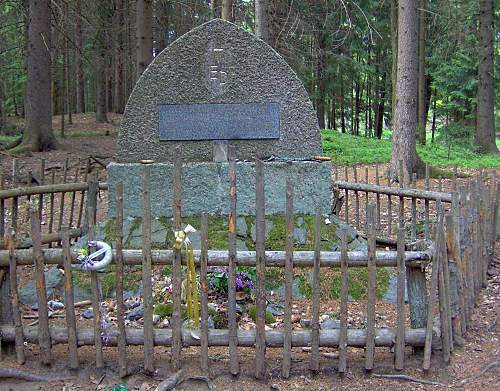 She married Josef Halsbach, a Czech air force officer, in 1923. He was 20 years younger than her, and it was reportedly not a happy union. Neighbors say she always carried herself with dignity and grace, while he was flirtatious behind her back with younger women in the area. He also did not share her love of black décor or stage props as furnishings. She was visited at her chateau by Czechoslovak President Tomáš Garrigue Masaryk in 1925, and gave him a copy of her four-volume novel In the Shadow of the Blue Rose, a romantic work set in Southern Bohemia. Many opera stars from her halcyon days also stopped by. She retired from the stage in 1926 and died unexpectedly on Jan. 28, 1930, of a stroke, while visiting her doctor in České Budějovice. 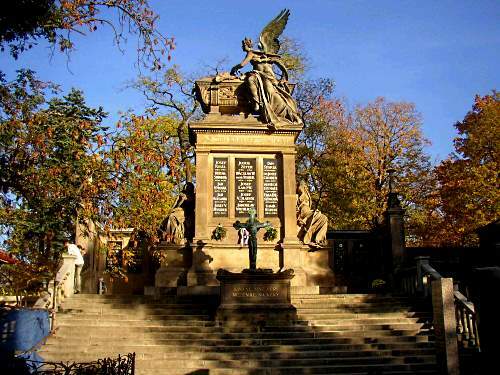 The funeral in Prague was rather large and spectacular, and she was buried at the Slavín tomb in the Vyšehrad cemetery, which is reserved for outstanding figures. Ema Destinnová has been on the Kč 2,000 banknote since Oct. 1, 1996. The asteroid 6583 Destinn, also designated 1984 DE, was named after her on Feb. 21, 1984. It orbits between Mars and Jupiter. A plum and rosehip liqueur called Strážská Černá Paní which depicts her black-cloaked image by Alfredo Cerigiolli on the label has been made since 1998, allegedly inspired by an idea she floated in a letter dated Nov. 10, 1920, which was sent from New York to a Czech distiller and suggested a special alcoholic beverage made in her honor called Strážská Paní (Lady of Stráž), leaving out the reference to “black”. We are ardent collectors of Ema Destinnová memorabilia, so if anyone has some of the Kč 2,000 banknotes with her portrait, please don’t hesitate to send us a box of them. We are also accepting cases of Strážská Černá Paní liqueur. Baron Leonhardi, who owned the chateau at Stráž nad Nežárkou until 1908, was himself an interesting character. He was a member of the Austro-Hungarian Imperial Council and later of the Bohemian Diet (Böhmischer Landtag). 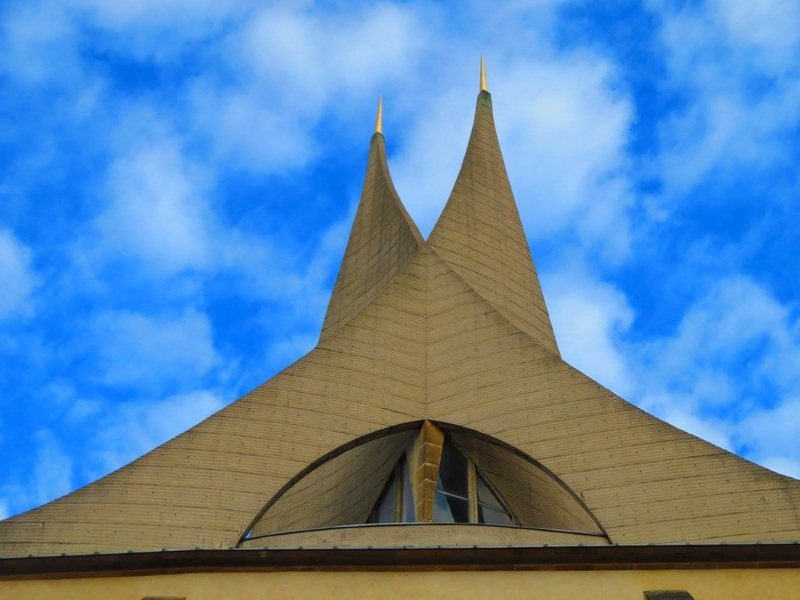 He founded the first Czech theosophic lodge called the Blue Star, and introduced the concept of theosophy to the region. He was also involved with a discipline called Martinism, which seeks to bring humanity back to a closer relationship with the Divine and the universe. The chateau’s roots go back to the 12th century, but it was largely rebuilt by the Šternberk family after a fire in the 17th century. The chateau unfortunately had a troubled history after Destinnová’s death and served as a German military headquarters in World War II and as a mental hospital for 30 years during the communist era, so many of the original items are gone. 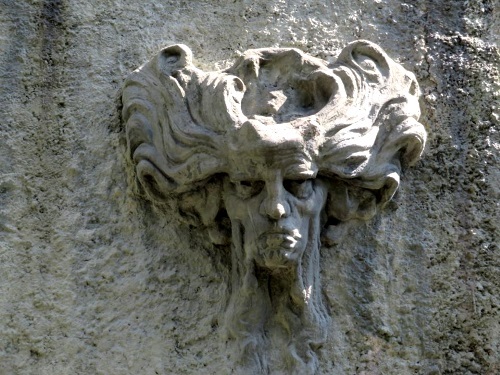 Sculptor Ladislav Šaloun died in 1946, and his villa where séances were held became protected heritage in 1958. It is not open to the public, but mystical designs including an inscription in Greek letters and a godlike face are on the facade. 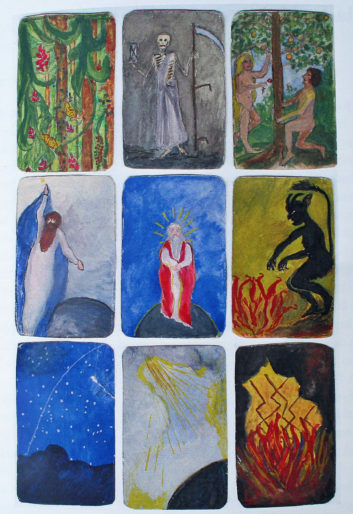 Two of his sculptures can be seen in The Tarot of Prague. Both of them date from 1908–11 and are on the corners of the entrance to Prague City Hall. Rabbi Löw can be found standing in for The Hierophant in the Major Arcana. The Iron Man or Iron Knight, a dark faceless knight who has become a ghost, is on the Five of Cups.